Iron scow in the upper Niagara River. This year marks the centenary of the iron scow (or “Old Scow”) wreck in Niagara Falls, and Niagara Parks will be paying tribute to this event with the unveiling of a new plaque on August 6th, 2018. In honour of this historic Niagara landmark, let’s revisit the story of what happened on that fateful day on the Niagara River when the iron scow became legend. It was August 6th 1918 when a small dumping scow with two men aboard was dredging up sandbanks on the Niagara River, upstream from the Canadian Horseshoe Falls. The scow was approximately 1.6 km up-river when it broke loose from the tugboat that was meant to bring it back to shore and began heading for the brink of the waterfall. After breaking loose, the scow got caught on a rock shoal 838 yards from the waterfall’s edge, leaving the two men stranded in the middle of the turbulent upper rapids of the Niagara River. The harrowing rescue mission of the two men onboard the marooned scow involved heroic efforts. A rescue boat couldn’t be sent to reach them, so instead, a lifeline cannon was brought to the scene by the U.S. Coast Guard to shoot a line from the Toronto Power House to the barge. It was this method, along with the tireless efforts of many people that brought the men back to shore using a breeches buoy rescue device. 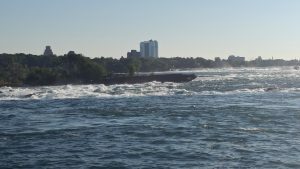 While the two men were able to return to safety after the wreck, the iron scow still remains stuck in the upper Niagara River, just a short distance away from the brink of the waterfall. Join Niagara Parks in honouring this historic Niagara Falls event on August 6th, 2018. The event takes place at the old Toronto Power Generating Station on the Niagara Parkway from 7-8pm.